In my season review of Toronto FC, I asked whether we should be satisfied with the team results during the 2015 MLS season. The same question could be asked about the Vancouver Whitecaps in 2015 and it’s interesting that fellow RNO writer Harjeet Johnal was able to have a season ending interview with Whitecaps President Bob Lenarduzzi and asked him tough questions, including his overall opinion on the season. Lenarduzzi said his preseason objectives were to win the Voyageurs Cup and host an MLS playoff game, which the Whitecaps accomplished this season. 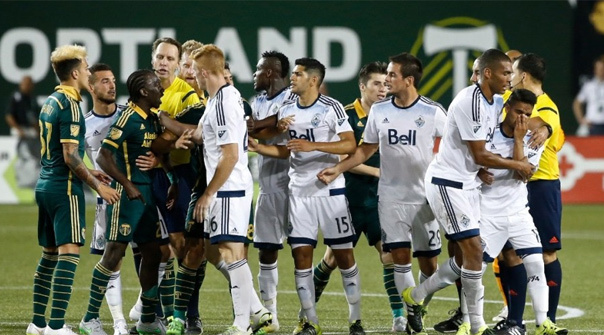 In my 2015 Analytical Preview for Vancouver, I did see Whitecaps making the playoffs. However, the playoff game would be in the first round and not a conference semi-finals, I also predicted Vancouver would win the Voyageurs Cup with the Impact dealing with last season’s CONCACAF Champions League, and Toronto FC had such a desire to finally make the MLS playoffs I didn't expect them to take the Voyageurs Cup seriously. While the Whitecaps did achieve these preseason expectations, personally I'm not sure the club could be completely happy with their performances. Especially considering how they ended the season with a five game winless streak before winning the last game of the regular season and then going out to Portland in the playoffs 2-0 on aggregate. The truth is Vancouver only won three MLS games at the end of season after almost clinching a playoff spot during a three game winning streak in early August. This is not the first time in the Whitecaps history where high hopes ended poorly, as both in 2012 and 2013 the club struggled in the second half of the season, which lead to the firing of then head coach Martin Rennie. I'm not saying the Whitecaps should fire Carl Robinson, who has done very well, surprising many in MLS media circles by making the playoffs the last two seasons. Robinson is a defense-first coach and this is depicted on the pitch with the Whitecaps in 2015 having the third worst possession in the league in 2015 and one of the worst disciplinary records. However, his direct style of play allowed Vancouver to outscore their opponents by nine goals, tied for the league best defense and they actually generated as many shots and on target as any other club in the league. Yet this style of play is sometimes difficult to watch as a fan, which had influence on the degree to which I closely followed the Whitecaps during the 2015 MLS season. Every time I turned a Whitecaps game on television or the radio it seemed Vancouver were in a 0-0 draw mostly at home or up a goal and holding on in the second half. Even in the games where the Whitecaps won easily, they didn't look overly exciting doing it, as with many other MLS clubs during the 2015 season. Because of this I struggle with my overall opinion on the Whitecaps in 2015. Prior to the season, in my preview I did see Vancouver making the 2015 MLS playoffs, talked about the pluses for the club in goalkeeper David Ousted, full backs Steve Beitashour and Jordan Harvey, centre back Kendall Watson, the holding midfield combo of Matias Lara and Gershon Kofie, the huge potential of Kekuta Manneh, and the impact of a healthy Pedro Morales. I mentioned my concerns with Octavio Rivero, although also talked about his double digit goal scoring in Chile and Uruguay, and I had concerns regarding the rest of the senior team going into the season. My updated analysis is I underestimated the impact of Ousted and now feel Kakuta Manneh is the top prospect in MLS soccer and the current player with the greatest upside who could be successful with a top club in Europe. Manneh has exceptional speed and potential ball playing skills and showed in 2015 that he can be a starter and not just a dynamic player off the bench. Manneh ended the 2015 MLS season with seven goals and six assists and took 82 shots, which was as many as any other attacking midfielder/winger in the league. I think European clubs are already in the market for Manneh, although I think he should be with the Whitecaps next season but if he really breaks out in 2016 it will most likely be his last year. In the case of Outsted, I think he was robbed in terms of winning 2015 MLS Goalkeeper of the Season which he lost out to Luis Robles. Both New York Red Bulls winner and Outsted played in every regular season and Ousted allowed seven less goals, made 13 more saves, had four more shutouts and saved the Whitecaps four goals by saving four of six penalty shots allowed. Waston, who just recently signed a new contract with the Whitecaps, is a centre back with a great upside. 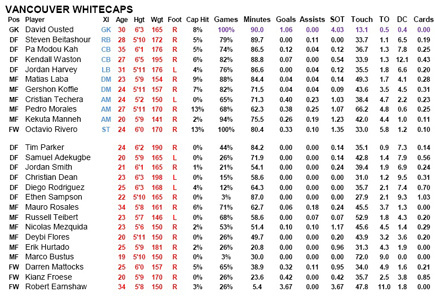 While at this point there is still questions on contracts, but the rest of the defensive core is strong in Pa-Madou Kah, Beitashour and Harvey, although are rather expensive compared to other defense in the league and the Whitecaps might look to give Christian Dean or Samuel Adekugbe a starting role next season. Both Laba and Koffie took a step back a bit in 2015 and concern might be they have reached their peak as players. Laba has a tendency of getting himself in disciplinary trouble, while Koffie struggled trying add a more offensive side to his game with Canadian Russell Teibert looking more effective in that role, although both players need to make a greater impact then just passing the ball short within the midfield. Morales came under criticism, which was justified in terms his offensive contribution and if you remove his penalty goals he only scored two and added four assists in 2015. While new signing Cristian Techera was more effective with seven goals and five assists, but I'm not sure how effective the 5'2 winger can be going forward. Up front Rivaro had double digit in goals for his third team/league in a row: Renistas in Uruguay, O'Higgins in Chile and now the Whitecaps. Rivero, to his credit, also played in all 34 games and had over 100 shots with 41 on target and was fouled 73 times. On a negative side, he only scored one goal in his last 12 games, including the playoffs, and his DP salary counts for 13% of the team’s overall cap. In my preview I mentioned Darren Mattocks career with the Whitecaps and in MLS is probably over and he is better off moving to a team in Europe now. While striker Robert Earnshaw, midfielders Mauro Rosales and Nicolas Mezquida played a small role during the 2015 season, although nothing to prove to be back in 2016. My greatest interest in the Whitecaps is their Academy and its role on Vancouver going forward as well as the Canadian National Team. I like Adekugbe and also think Dean can find a role for himself in MLS. I also think players such as Marco Carducci, Ethen Simpson, Jackson Farmer, Tim Parker, Deybi Flores, Victor Blasco and Kainz Froise can all make have an impact on the first team and be potential starters over the next few years. Although it is no surprise the player I'm most excited about is Marco Bustos, who after early season injuries scored seven goals in 17 games with VWFC II before making his MLS debut. The Whitecaps have a lot of good parts and I don't think there is any fear of the Academy pipeline stopping. The question becomes how to use these assets and develop a club who is not only going to make the playoffs but also challenge for a championship. The simple answer right now is the Whitecaps spend the money and bring in a team changing DP. Lenarduzzi mentioned a striker who can score 20 goals and in previous articles on RNO I talked about Emmanual Adebayor and Javier Hernandez, who both would make a major impact. Others in that role include Fabio Quagliarella, Vagner Love or even a real long-shot in Zlatan Ibrahimovic, who are all out of contract after this season. The other option that I think be interesting is a key player in the midfield such as a Michael Carrick or Xabi Alonso, who could dictate most of the midfield distribution and allow Morales to concentrate on the offensive side of the ball and the system also provide more opportunities for Rivaro upfront and the wingers. I know that the Whitecaps are a solid franchise, however by now I must admit I expected more from them as an MLS club, especially knowing their role in the old NASL and CSL. They have not been a disappointment with three playoffs years, a first-round bye and finally winning the Canadian Championship as an MLS club. Attendance has also been steady at 20,000 a game. Yet situations such as bad DP signings and the Camilo incident in the past, plus poor playoff performances feels like the club has missed out on opportunities. The questions going into to this off-season are first surrounding the holding on of players like Ousted and Manneh, then to bringing players in to take the club to the next level, but maybe the satisfaction comes from them being a consistent playoff team.